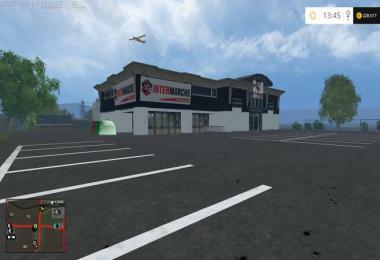 V 1.0: Alsace is the site of the incident. You can expect a challenging map with many different play possibilities and challenges in beautiful natural landscape with many lovely details. It is the rolling countryside between the villages Altkich and Dannemarie in Alsace. Apart from the two main towns there are the villages Aspach, Ballersdorf and Carspach, the railway line Stuttgart - Paris and the Rhine-Rhone canal. In the northeast and southwest mountain ranges are fitted with vast forests, the trees can be precipitated. There are a total of 64 fields, 3 fields and a separate hop field in a total size of about 1,200 HA available. 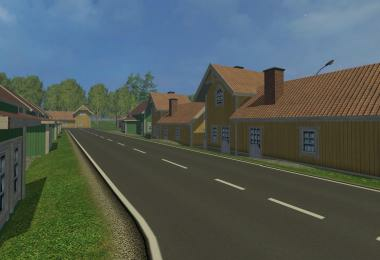 The fields are generated in the landscape and the road and of course maintained. It must often be carried out with a headland. On fruits are wheat, barley, rye, oats, triticale, spelled, sunflower, rapeseed, corn. Carrots, onions, potatoes, sugar beets and hops installed. Further fill types peat, sand, clay, beer, liquor, bread, chips, beet pulp, compost, Seeds2, fish, fish food and smoked fish are present. At transportable and tradable pallets wool pallets, dumplings pallets, brick pallets, plum, cherry and apple pallets, egg trays, wooden pallets and pallets are provided with washed potatoes. There are several outlets. 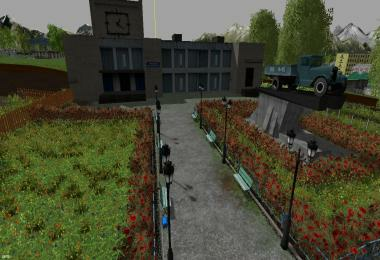 There is a courtyard with several depots and camps available. 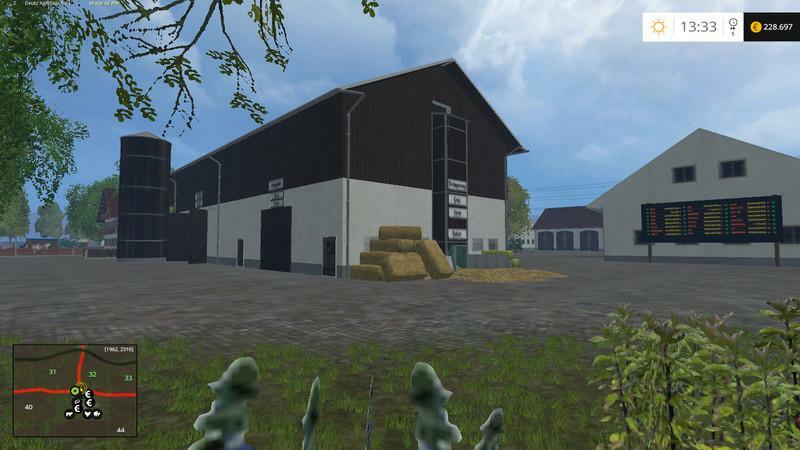 The straw and grass bed is on a loft, the grain storage in silos and warehouse for compost, beet pulp, chopped, silage, carrots, onions, potatoes and sugar beets are designed as basement storage under the depots with animated door. In addition to the main patio still exist a pig farm with pigs and cattle with Rinderhof, a poultry farm with chickens and geese breeding. 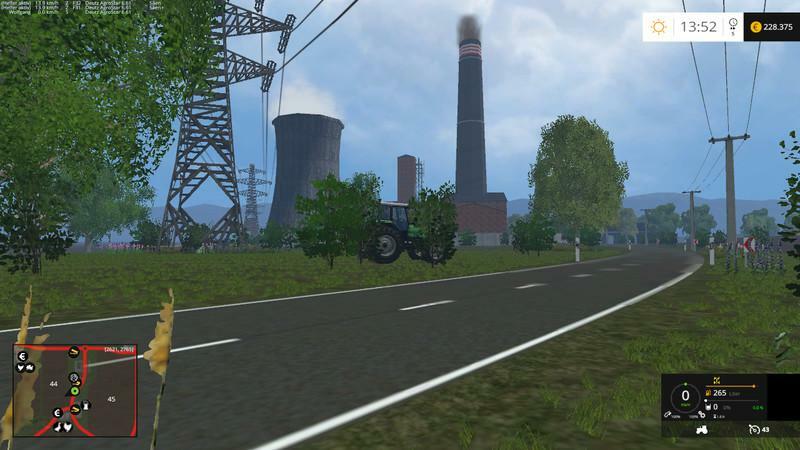 The farms have all been taken from Marhu in version 5.0. Matching the farms a Viehhandel for pigs and cattle as well as a poultry trade for chickens and geese are inserted. Here each hatchlings can be purchased at a significantly lower price than in the shop and are transported to the respective farms. 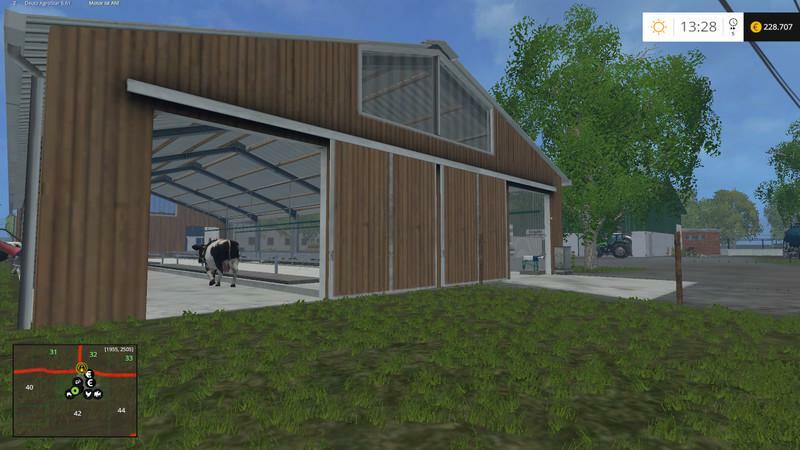 In the main courtyard of MixFeeder who BeetMaster, the compost Master, the SeedMaster 2K15, the Balemaster and turnips Schnitzler for direct feeding of the cows are installed. On straw beds can loose straw and grass are delivered and ends up in the hayloft. Besides trigger are installed which allow to dump grass and straw bales are automatically taken as loose straw or grass in the camp to the hayloft. 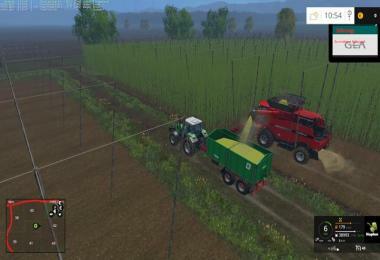 One can straw and grass bed so the loading wagons or bales fill. At animals cows, sheep and chickens on the main court, cattle, pigs, chickens for fattening geese are installed at the breeding farms. For the cows at the main courtyard stands the MixFeeder available. The pig farm is the pig feed production of potato washing system, the potato damper and the pig feed mixers available. This is also required to operate the pig, because pigs can be fed only to the pig feed from its own production plus water. The cattle in the cattle can be fed only mixed feed. This is what in the main courtyard, the mixer hall. In addition, only water is to be delivered. There are a total of 3 BGA installed. The large BGA has 4 Transit silos and 3 wedge silos with a total of around 4 million capacity and respective 3 processing bunkers and manure basin. The mean BGA has 2 Transit silos and a central processing stele. The small BGA has a deep bunker with limited capacity and a slurry tank. The Befütterung done with silage from the, located in the vicinity 7 outdoor silos. There is an interim storage facility where the silage can be stored in the outdoor silos on the BGA land and removed. The 3 BGA can be filled in SP with a trailer or a wheel loader. In MP only with the wheel loader. Brewery, sawmill; Bakery, distillery, dumpling factory, brickyard, Rinderhof, pig farm, chicken, SeedMaster, MixFeeder, BeetMaster, compost Master, Large BGA, Medium BGA, fountain on the farm (free water), water draw at WWTP (free water), outlet for Multi fruits at the flour mill at the train yard and the Intermarche, fish feed on the fish farm. Feeding the fish in fish farming can be done only with the produced fish feed there. Andres feed will not be accepted. An interim storage facility exists. It was installed a warehouse in which the products of the bakery (bread), the brewery (beer), the distiller (liquor) and the smokehouse (smoked fish) can be stored to await example, a large demand. There is an instruction manual that requires urgent attention, because otherwise will intercalation removal is still possible at the warehouse. Each product is only accepted a the respectively stated goal or output. South of Carspach is the central power station. There, the necessary energy is produced for the whole area. To the various production plants must be angliefert at the respective Schütte peat in sufficient quantity to operate here. The chutes are labeled. Only when the establishment concerned Tord is also available, production can begin. 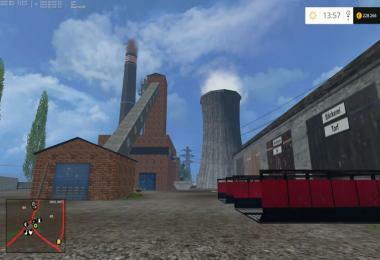 The peat can buy the peat in the west and transported to the power plant. Am Kraftwerk is also an interim storage facility for the peat, so who wants to deliver a larger amount, to then distribute them to the individual businesses, this can be done. 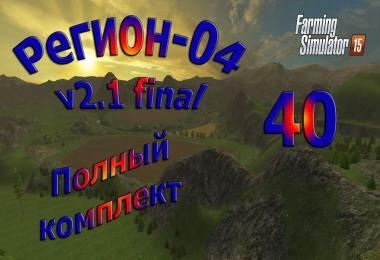 This mod MUST NECESSARILY located in modfolder because the map is otherwise NOT loaded. The predetermined Giants FillTypes be exceeded. This works ONLY when this mod in the folder. FIELDS must be purchased in the register in Altkirch !! (See PDA / follow signs; highlighted in the PDA with a yellow euro sign and a book stack). There MANURE STORAGE around the map and distributed MANURE BEAMER in all places where manure (BGAs, pork and Rinderhof, main courtyard) is applicable. 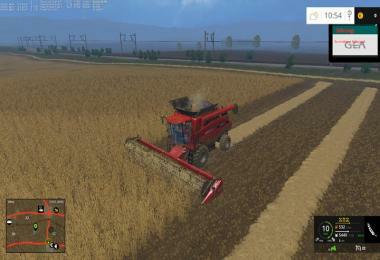 You can tilt the manure into the projector and then out of the bearings on the map again refer (for example, slurry tanker filling). There is also MIST STOCK HEAP that on the projector at the court (wheel loader) or be filled directly to the manure storage. 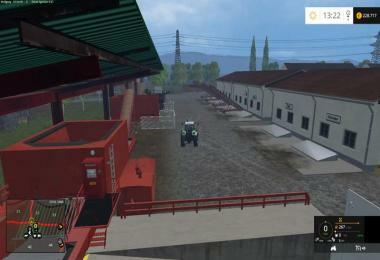 The manure then lands always in stock and can be taken anywhere (Miststreuer fill). The filling level of the manure and slurry storage is there in each display. 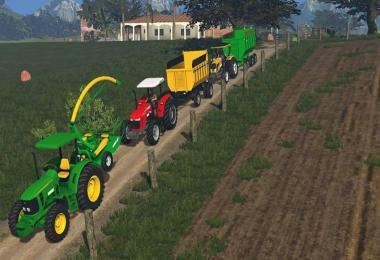 There is a silage Beamer to the BGA. When pouring off silage there, these lands in the silage storage on the farm and can be there and also to all the fattening farms again be removed (feeding). Who does not want this assistance, they do not have to use. 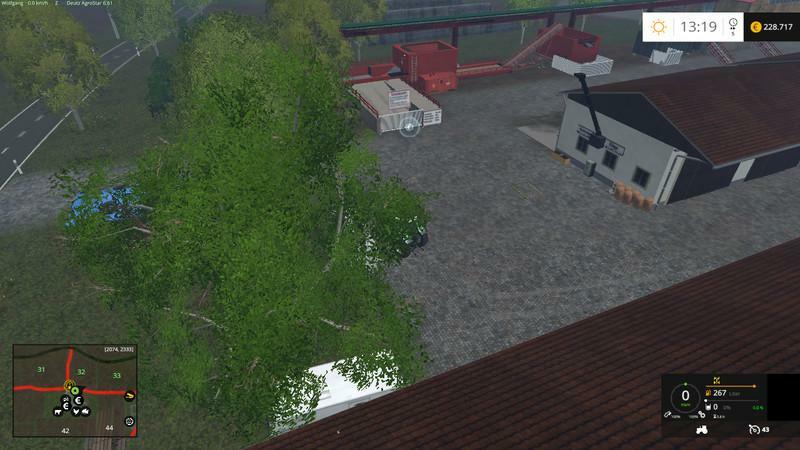 In the farmhouse on the farm (entrance next to the SeedMaster) are "Teleporter" transporting a fast to different parts of the map (for example, register for fields to buy). 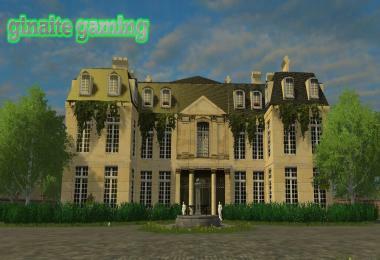 are found in the destination again teleporters that will bring one to the main courtyard back. The respective destinations are designated with a sign. The fields are all contains fertilizer! They need to be fertilized again until after the first harvest and sowing. Who is nevertheless attempted, will see that the helper to stop after a short distance. 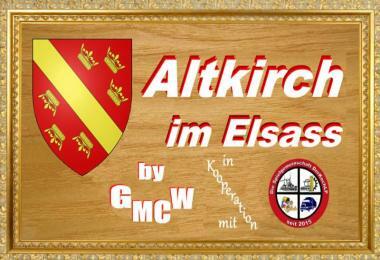 Again the NOTE: the supplied zzz_multiFruitModul_Altkirch MUST in modfolder. All other (on other maps) must also be removed from the folder. Another is not working! Please note. In the brewery is made from barley, hops and water then beer, which you can sell. In the bakery is from wheat, spelled, sunflower and water then bread, which you can also sell. In the distillery, schnapps from wheat, barley, rye and water, which you can sell. In the smokehouse is from fish and chips (woodchips) then smoked fish, which you can sell. Besides you need for all productions peat at the power plant. The hop garden I designed and the plant will end up a height of 6 m, because that in hops is so. 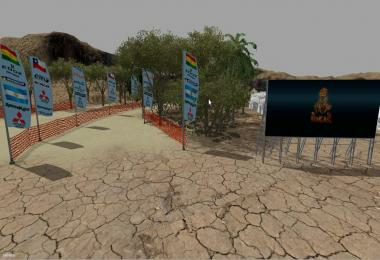 Among the textures suffer somewhat, but look more realistic than the terrestrial plants. 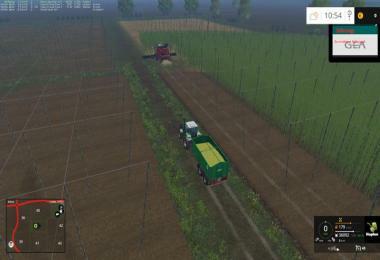 Hops are harvested with the combine with corn head. Is not really realistic, but by these settings have a chance to harvest the hops ALL players, even those who are not able to rewrite devices. Fish, smoked fish, liquor, beer and bread can also be transported with normal trailers. I have endeavored to provide FillPlanes that make it look more realistic. The particle systems I have so equipped. Again, ALL can use it to transport bread and beer. Who wants to grow no hops, can purchase this at garden centers also. There you can also sell it if you have too much time harvested. Who wants to cheat, can buy it there low and sell it immediately and make a killing on, but is not sense of the game. Hops can be stored on the farm, where it can again be removed. From the self-produced compost and water apple, plum and cherry pallets are produced which can be sold at the farmers market. It is ONLY with your own compost from the compost master at the court. I have always disturbed the giant reapers, lying around in the yard. Therefore, there is behind the feed stores a cutting shelf, in the fit 6 large reapers. To be able to store there, you need the supplied tool. This can grow to the front telescopic handlers and it fit the reapers and lift onto the shelves. The loader but needs a counterweight. 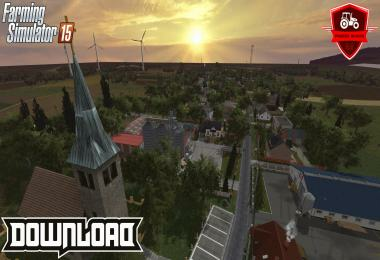 The download link is given below, there are at Modhoster. The tool is a self-made, as the shelf also. If you like it, it can use. 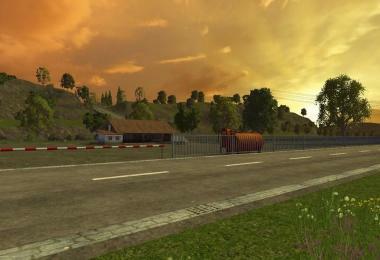 There is also a mod following link http://www.modhoster.de/mods/header-carrier--2 the ermöglichst transport. The milk is automatically picked. A milk trigger is installed at the milking machine. One can therefore invite the milk at the milking machine and transported to the dairy in eimo AG or used for breeding facilities. The eggs can be at the farmers market in the town of Minden sale (eggs stand at the end of the market). They can be held for the GründüngerMod reap in two ways. Once the mower for grass and shoot with the loader wagon. 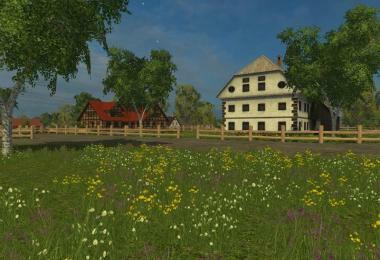 It is then added to the grass and can be used as well. One can also clover and lucerne crops the BIGX and disc cutter and it is chopped (chaff) out and this can be used as such (silage silos). For this purpose, the multi-Mod Moving is necessary. These are to reap all with a combine harvester with corn head. Is not very realistic for the onions and carrots, but was not otherwise possible because of the innovations in the ParticleSystems. 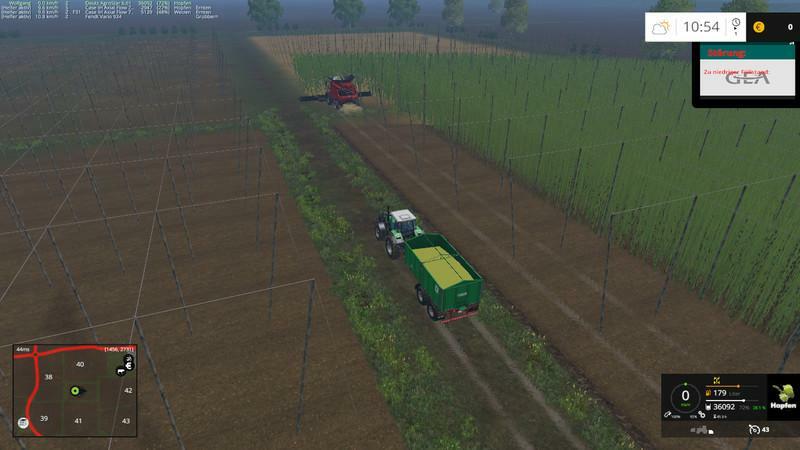 I really wanted to like the LS 13 use the beet harvester, but that did not work can überzeugend.Säen you the fruits with each seeder, which can also sow corn. This can be filled with sugar beets and potatoes and the feed trough fills with compound feed. But it will be visible only after a few minutes. This is a practical replacement for players who have a lot of cows and feeding with mixed feed forgotten times. There are installed the latest pig and cattle from Marhu. The young animals are fattened for broilers, fattening geese, pigs and cattle which can then be sold. Kittens can be purchased not only in the store, but cheaper also shown at the cattle market to distribute itself on the plants. For the transport of young animals is a special trailer as JoskinBetimaxRDS 7500 v3.5.2 or Stralis Clixstar needed. The juveniles can be charged to the mast and put to another mast. The cattle market for pigs and cattle, as well as chickens and geese are marked on the PDA with a blue euro sign. As a special pig ONLY accept pig feed from its own production and the Cattle ONLY mixed feed from the feed mixer hall plus each water to achieve a 100% rate. In addition, it only grass, but this leads to a lower production rate. The PDA in the further mentioned feed (silage, root crops, cereals) are redundant and are no longer needed. On pig farm potato washing system, the potato damper and feed mixers are installed to produce pig feed that may be fed into the feedlots. In the warehouse there is a stock pile of pig feed, and space to store pallets with washed potatoes. There are two sawmills, one of Marhu and once by Giants, with each timber in the immediate vicinity, so you do not have to drive so far. The sawmill of Marhu located in the southwest. The sawmill itself must with stems (right side) and fuel (left side) are supplied and then starts work. On the back then pallets with boards and wood chips come out. The boards pallets can then be transported to Holzhandlung S & H and gets money. The chips can be used again as fuel and the surplus sale (power plant or straw power plant). The second sawmill is located at the other end of the map in the Northeast. There you can the deforested stems directly sell and send off the train after delivery. The longer the tribes, the higher the profit. On the PDA, both Sawyer works are marked with a saw blade. The SeedMaster 2K15 is installed on the farm and can seed (pickled) manufacture. 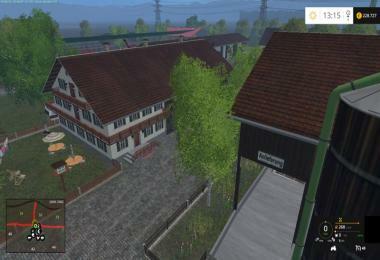 There is also a warehouse for the farm. One can produce seed sell and get a pretty good price for it, because there is also some effort so to produce it (Jardi in Altkirch and land trade in Dannemarie). The SeedMaster found in the main house behind the goals. Around the map are supply points (in PDA marked as VP) installed. There you can all fruits tilt (without root crops), shredded, straw and grass and they then end up in the silos at the farm (reduction of travel distances). You can eat there every fertilizer (normal fertilizer and lime), seed and fuel. There are also each slurry and Mitlager connected where slurry and manure can be removed (reduction of travel distances). These can be used if the corresponding ZZZ. located in modfolder. I assume that choppedStraw and GMK known. For GründüngerMod I plant clover and lucerne provided as fast-growing varieties, but it also works with all other crops. If they have been sown on an unfertilized arable and is then plowed or grubbed, the field is automatically fertilized. The necessary for the multi Sprayer Mod weed is also available. It just needs the ZZZ_multiSprayer in modfolder (Link S.U.). Warning: this is a lot of effort. GülleMistKalk Mod: http: //marhu.net/phpBB3/viewtopic.php f = 141 & t = 1058 (if required)? Should individual links are no longer correct, please send me Nchsicht. About Google one can surely find quickly the right. There is a log error: Warning: Deleting object 'BaleTrigger' before all triggers are removed. This has existed since the installation of the BaleMasters and has no impact on the game. Otherwise in my log error free. In server mode, is still warned that the number of GRLE and the size of the shapes file was exceeded. This has, to my knowledge, no effect on the operation of the Map (information from Giants right). 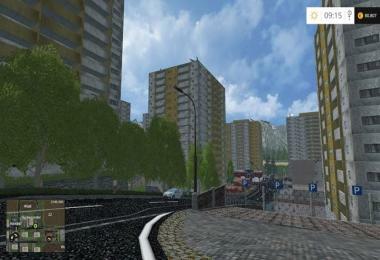 The idea of ​​a joint project comes from the Community Games DerKochLP (www.derkochlp.ch). The card has been built by me and tested by the player community. Further thanks go to my game friends Klaus, Tom and Udo, who also tested developed ideas. I hope I have said everything. I ask you to respect the work on the map and not to offer them without the consent of my other portals. Très belle carte...mais je n’ai pas d’icônes pour acheter les objets et les champs. Merci de votre aide.